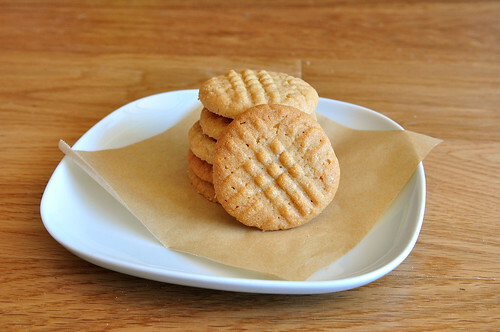 I've always loved peanut butter cookies. They're definitely in my top 5 list of all time favorite cookie varieties. When I was in Girl Scouts, I always ranked Do-si-dos above Thin Mints and Samoas. When my mom would go to the local bakery and ask what type of cookie I wanted, it was almost always a peanut butter chocolate chip cookie. 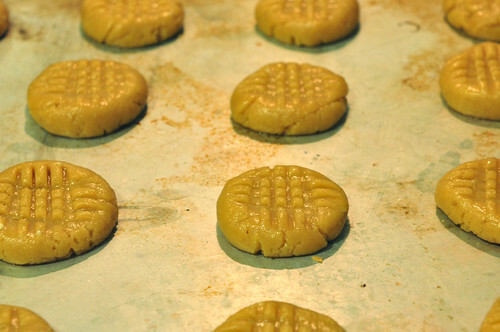 Peanut butter cookies rock, and there's nothing you can do to convince me otherwise! 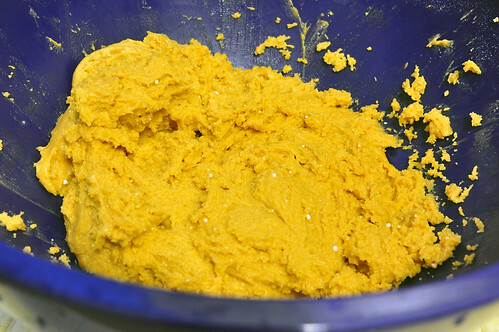 My gram's recipe box contains several variations of the traditional peanut butter cookie, but I decided to start with the cake mix cookie recipe first, for a couple of reasons. 1.) Some of the other recipes are ones written out by her friends, and have suspiciously clean recipe cards. 2.) I was already making macaroons that day, and felt a tiny bit lazy. 3.) 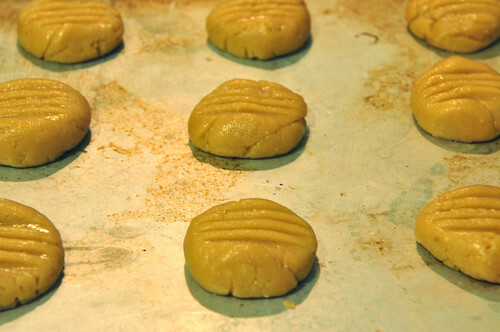 I had never made peanut butter cookies with a cake mix base before, and wanted to see how their texture would be. Since I was already planning to coat the macaroons I was making in chocolate, I decided to do the same to these cookies - adding chocolate to peanut butter cookies only makes them even more delicious. I used the seed method of tempering the chocolate, since I don't have a chocolate thermometer or a block of marble or granite handy. It worked out just fine, and was pretty easy. 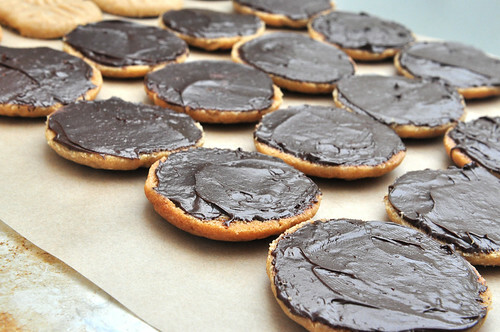 I would recommend it if you want to add a little chocolate to these or any other cookies you make. Seriously, I am the worst at working with chocolate, and look how these turned out! Now let's make those cookies. Press with a fork that has been dipped in water. 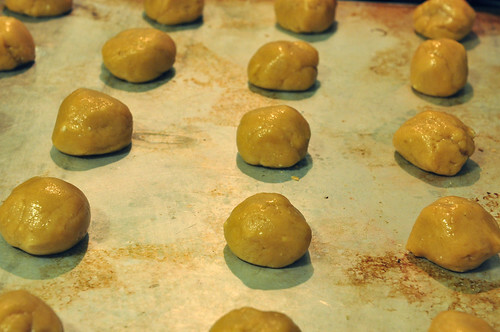 Bake 10-12 minutes, until brown. Cool on cookie sheet 1 minute, then remove to rack to finish cooling. I let the cookies cool for an hour or so before I coated the bottoms in chocolate. I just took a dollop of chocolate on a knife, and smeared it around on the base of the cookie. Then I let them harden for an hour or so on a cookie sheet lined with parchment paper, just to be safe. These cookies went over pretty well at the BBQ that I took them to - there were only a couple of cookies left over. Mhm, these look gorgeous! 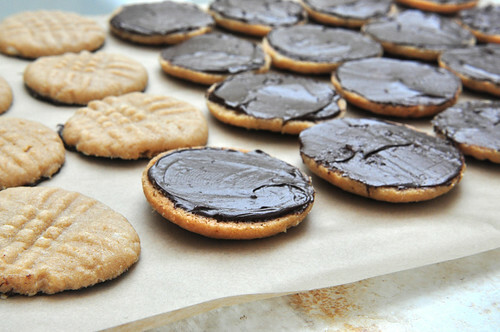 I love peanut butter cookies! Too good. I want to make these now, but I've just made matcha tiramisu and it's almost midnight. Soon. I promise both you and myself (maybe a little more myself). 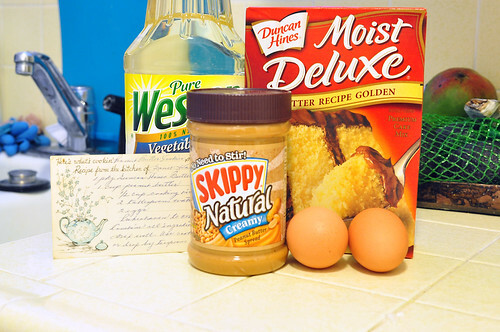 Can you make these with a chocolate cake mix? So how did the texture turn out? I bet that they would be awesome with chocolate cake mix! I never would have thought of that, but it's a great idea. Let me know how it turns out if you try it! The texture of these was pretty firm, much less "cakey" than I was expecting. I was a bit worried that they would crumble when I tried to coat them with chocolate, but it turns out that I didn't need to be concerned. I love how simple the cookies are to make!! 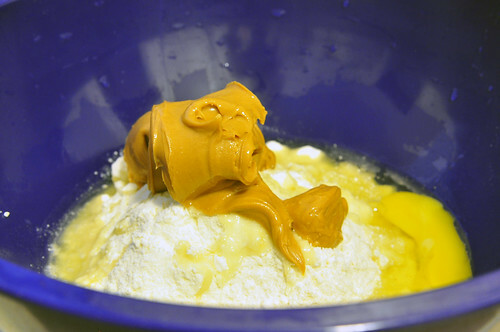 I never thought you can use cake mix! Smart!! Love the chocolate on the bottom as well.